Make of this what you will: Police in the United Arab Emirates contend that last week's extended BlackBerry service outage significantly reduced traffic accidents there. 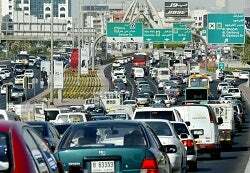 In Dubai, traffic accidents fell 20 per cent from average rates on the days BlackBerry users were unable to use its messaging service. In Abu Dhabi, the number of accidents (last) week fell 40 per cent and there were no fatal accidents. Brig. Gen. (Hussein Al) Al Harethi said: "Accidents were reduced by 40 per cent and the fact that BlackBerry services were down definitely contributed to that. ... People are slowly starting to realize the dangers of using their phone while driving. The roads became much safer when BlackBerry stopped working." If the purported cause and effect here is actual cause and effect, then perhaps instead of BlackBerry maker Research in Motion offering "we're sorry" gifts to inconvenienced customers, those customers - at least those in the UAE - should be sending thank-you notes to RIM. Texting and driving is against the law in the UAE and The National story mentions statistics about fines that are levied that would indicate more vigorous enforcement may be playing a role, too. And a final note: While paling in comparison to any possible effect on traffic safety, we did learn several years ago that an extended disruption of BlackBerry service can be detrimental to interpersonal relationships. See: BlackBerry owes this guy a girlfriend. Welcome regulars and passersby. Here are a few more recent buzzblog items. And, if you’d like to receive Buzzblog via e-mail newsletter, here’s where to sign up. Follow me on Twitter here and on Google+ here. Steve Jobs’ favorite picture of himself? Probably this one. Has Google’s CEO stopped using Google+? Happy Programmer Day, the Rodney Dangerfield of made-up holidays. 16 milestones of a million, billion or more … from just the past month. Did Google+ ban cleavage-snuggling LEGO stormtrooper? Imagine your neighbor built a fake Apple store. What Microsoft paid The Stones to help launch Windows 95. 2011’s 25 Geekiest 25th Anniversaries.